This year for Autumn my new neighbor bought an adorable wreath to hang on their front door! Of course being the crafty goddess that I am, I thought to myself...I should make something for my front door! I immediately started digging for inspiration, but when my new G45 paper showed up from the eP store...I KNEW that's what I was using. First I started with a 12x12 sheet. Use your favorite punch or deco scissors for the top 2 edges. Crease the bottom corner so it rolls and use score tape along the edge that will be on the outside. Roll your paper using the inside edge as your working side and slowly roll it into the exposed score tape. Make the roll as tight or as loose as you want. 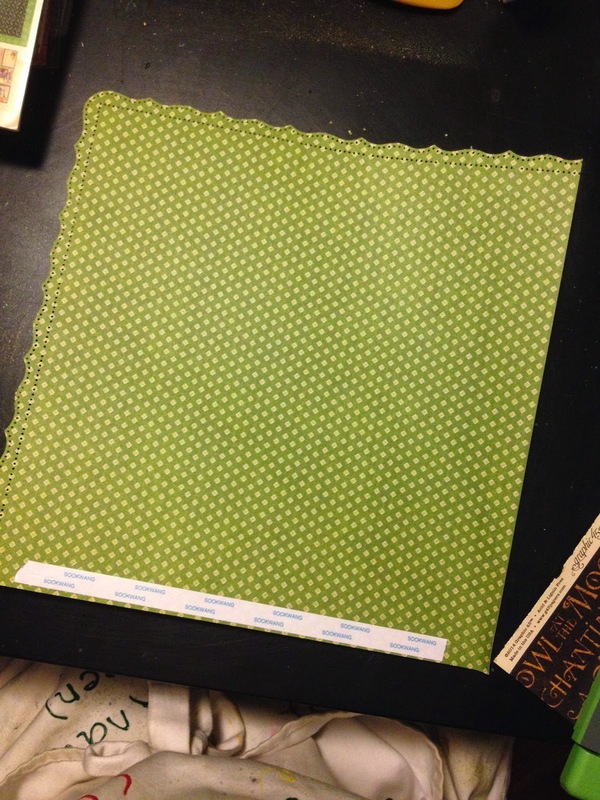 Cut 2 squares of 8x8 from a coordinating paper for the 2 smaller cones along each side and repeat the process. 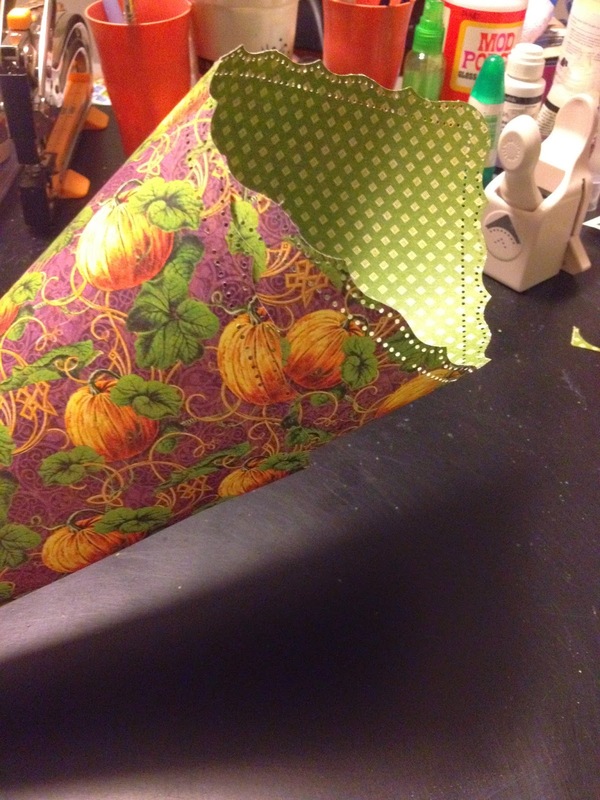 NOTE: I would punch holes and insert my hanging ribbon NOW. I did mine after it was embellished and it was a pain. 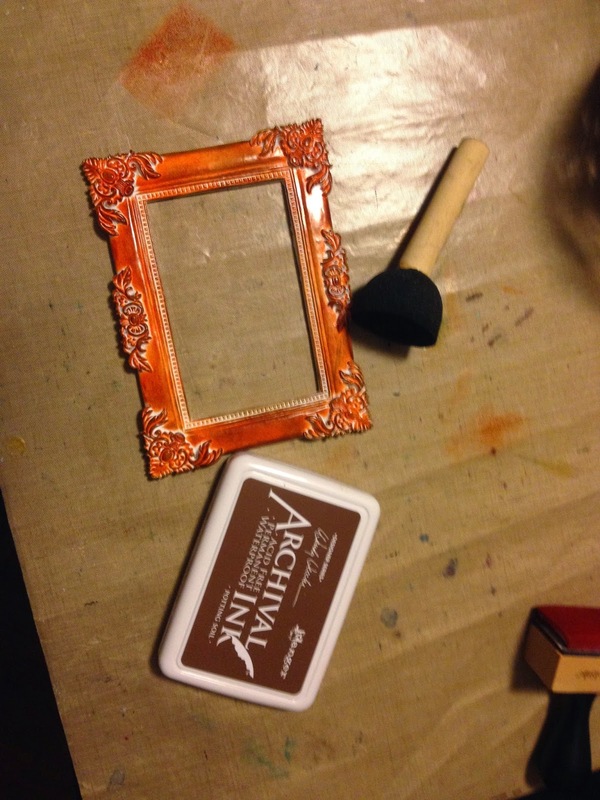 Use an Archival ink to add color to resin pieces. Resin is non porous so distress ink and pigment ink will wash right off. Wendy Vecchi archival ink is perfect for this but since I don't have orange I used my StazOn. I used Archival ink in Potting Soil to accent the piece and highlight. Fussy cut a pice for frame and a few pieces for the cones themselves. 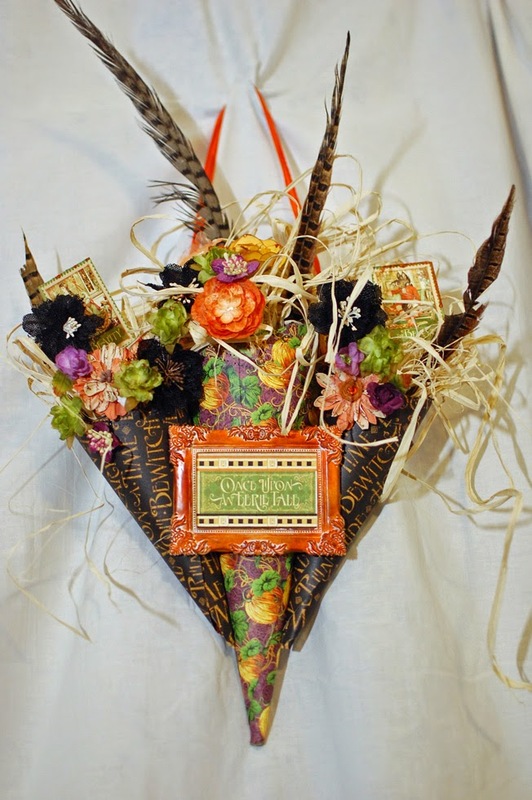 Add some dollar store raffia, some pheasant feathers from your hubby's last hunting trip, and embellish with loads of Petaloo!!! 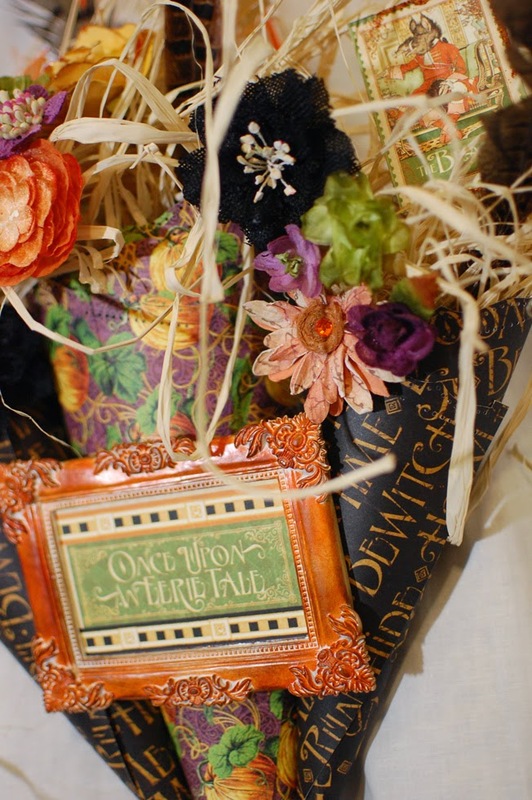 I also used some glossy accents to add rusty hinge distress glitter randomly along the flowers and the paper pieces. Here's a close up of the completed frame. 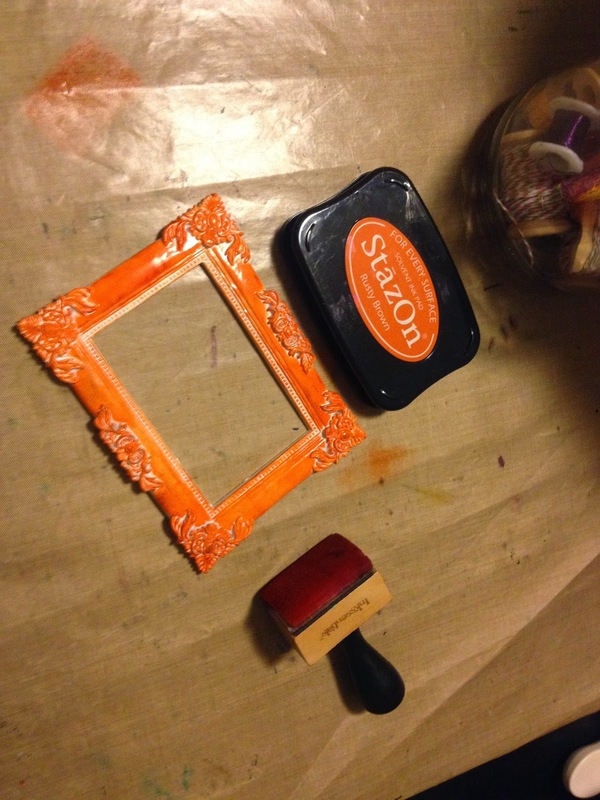 So get crafty this Halloween ePeers and make something spooky for your home!! YOU are going to be the envy of your new neighborhood, Andie! 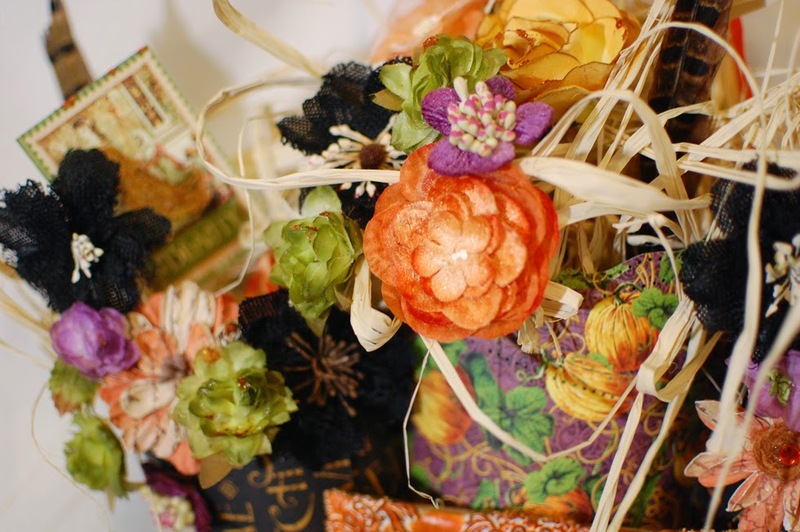 I absolutely LOVE this creation and what a FAB way to use all of your Halloween goodies! Can't WAIT to see what you make for Christmas!!! 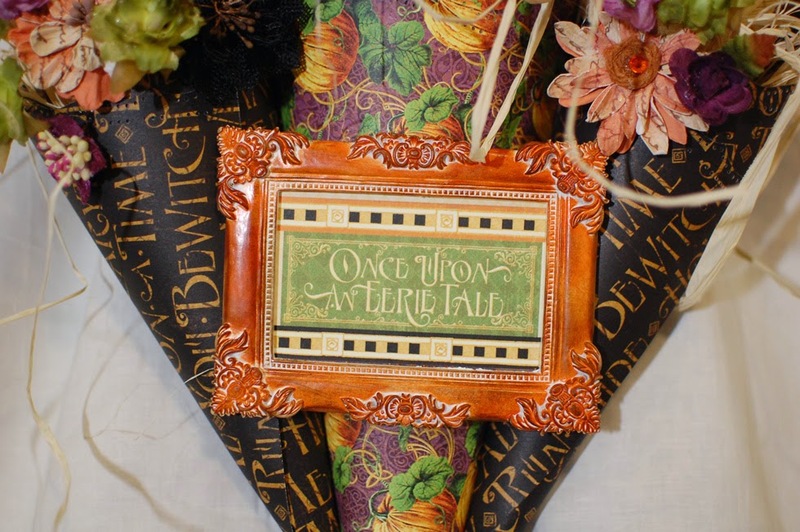 What a gorgeous door decoration for fall Andie! guess you showed your neighbor who the craft one is!! Love the cone design! oh WOW - this is absolutely GORGEOUS!!!!!! !